After a car accident, my car was towed to the tow yard. Should I pay to get it out immediately? Every case is different. When you’ve been involved in a car accident, you have two main claims: one for your property damage and one for your bodily injury. Your property damage claim should resolve relatively quickly. As soon as the at fault party accepts liability and confirms that there is valid coverage for the loss, they will then assess how much damage was done to your car. The insurance company will either have someone go out to your car to see how much damage was done and how much it will cost to repair or they will ask that you send your vehicle to a body shop an inspection. After it has been inspected, they will let you know how much it costs to repair or whether your car will be totaled. This process to handle your property damage is relatively quick. The damage for your car should be paid for within one month – especially if liability and coverage is clear. The process for your bodily injury claim can vary significantly. Some cases are able to resolve very quickly, but some can take more than one or two years. In most cases, the claim for your bodily injury is made after you have finished medical treatment. The length of your medical treatment depends on how much you have been injured and it is difficult to tell how your body will respond to medical treatment and when your pain will go away. Once your medical treatment is completed, a settlement demand letter will be sent to the at fault insurance company. The insurance company will usually respond within 30 days. If their offer is acceptable, then the check should get issued within 30 days. If the offer is not acceptable, it is possible to negotiate with the insurance company before filing a lawsuit. If you are unable to negotiate a fair settlement, then a lawsuit will have to be filed to have an opportunity to get how much you are looking for. After your case is filed, a trial is date set approximately 1.5 years from the time of filing. A lawsuit being filed does not automatically mean that you will have to go to court or that you will have a trial, but you have to be prepared to go to court and/or stand trial. As you can see, it is hard to say how long it will take to resolve your case. There are also other anticipated roadblocks that may prevent your case from settling quickly. There may be difficulty in getting medical records, medical bills, and proof of lost wages. Stay patient in the process and it will help you and your attorney come to a successful result. 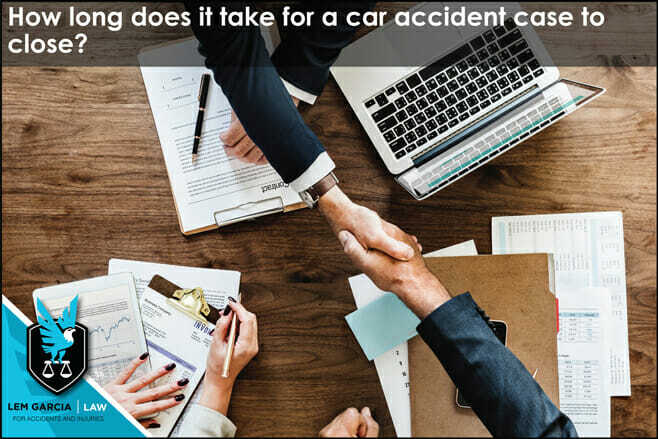 Lem Garcia, is a car accident attorney in West Covina and helps people who have been injured in a crash get compensated as much as possible, as quickly as possible. Case consultations are always free and without obligation. By: Lem Garcia, West Covina car accident lawyer.